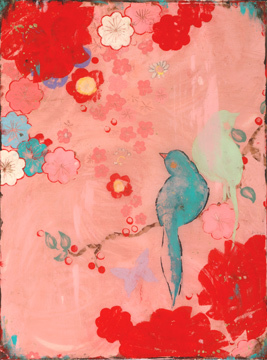 New for Papyrus Cards-Kathe Fraga Art for Mother’s Day! Mother’s Day is just around the corner and I’m so delighted to let you know that I’ve collaborated with Papyrus Cards to create a really special card for Mom. 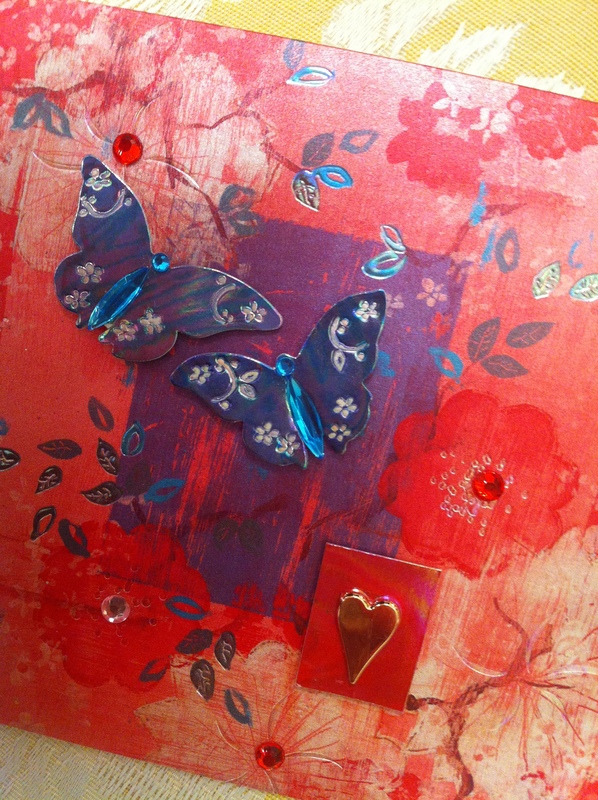 There are jewels, embroidered gold butterflies, sparkles and more bling highlighting my original painting. 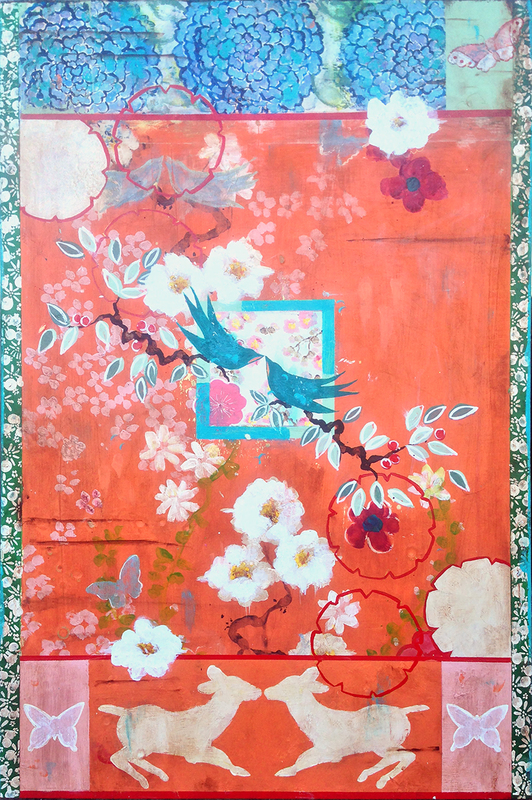 I’m delighted to be included in the new December Show, “Wonderland” at Roby King Galleries on Bainbridge Island. 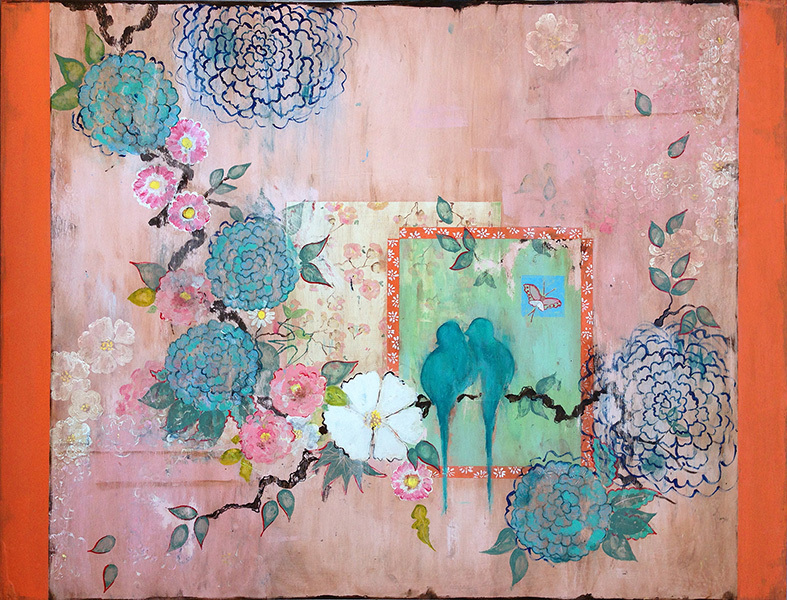 The group show of gallery artists showcases a wonderful collection of work, all inspired by the story of Alice. I have four new pieces in the show. While I’ve always loved the magic and wonder of Alice in Wonderland–the characters, the environments, the interactions–the one thing that always has fascinated me the most about the tale is the absolute visualness of it all. The colors, the patterns, the zaniness of costumes and of beautiful flowers, Chinese lanterns above the tea party. That’s what has inspired my new work for December at Roby King. 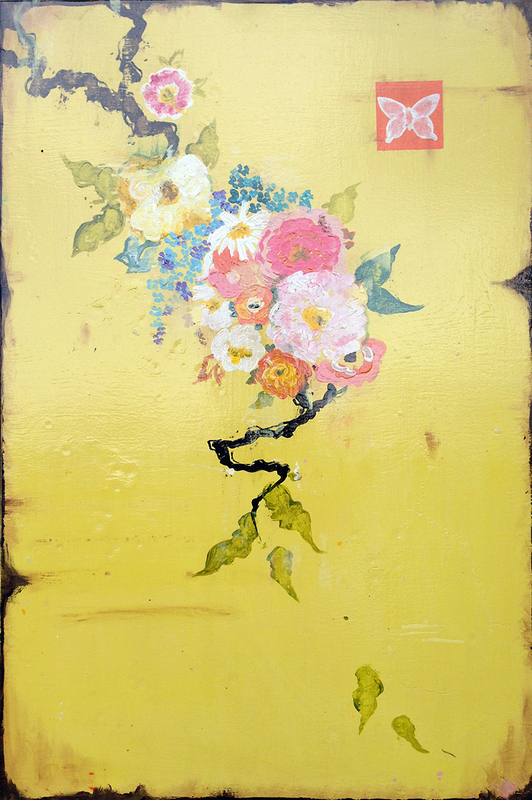 Here are my ideas behind the new work: Gold leaf in the paintings represents a connection to the blond Alice, the bright gold watch of the White Rabbit, the tiny crown on the terrifying “Off with their heads!” queen. 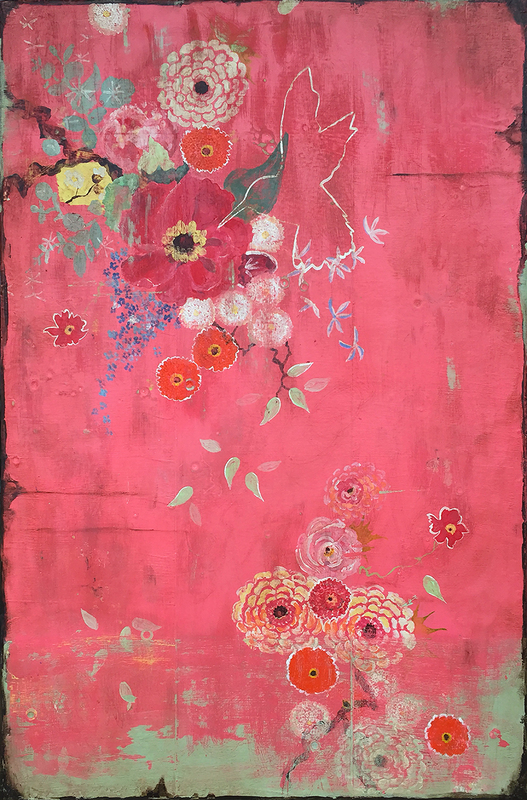 Pinks and reds are constant themes in the story–I’m reminded of how long I’ve been mesmerized by the idea of painting a blooming garden with actual paint! The Chinoiserie motifs reflect the tea party’s joyous color and pattern-filled event, from the table to the china to the guests themselves. Happy 150 Year Anniversary to Alice and Lewis Carroll! December: Good things come in small (12×12) packages! Brrrr, the warm sunny days of Fall on the Island have changed to grey and bluster, power outages and wild waves on the beach. The good news is that there are plenty of excuses for hot chocolates, roaring fires and, most importantly (and fun), lots and lots of color in the studio. 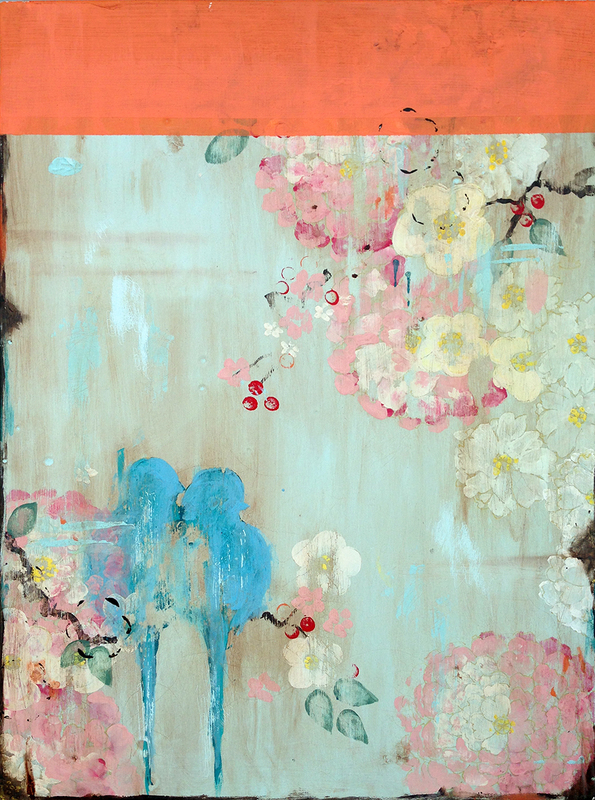 As always, my art is inspired by the romance of vintage French wallpapers and Chinoiserie with a modern twist. Here’s a sneak peek at one of my 12×12 paintings that are easy to fit into Santa’s sled. Stay tuned for more! It’s been a year in the making–good things take time, right? But that’s because Papyrus really takes their time when it comes to the design and production of their beautiful card collections. I was contacted last year and couldn’t wait to see the completed design. Gold glitter and a gold tassel complete the painting, along with a gold foil lined envelope. Papyrus is known for their extraordinary attention to detail. 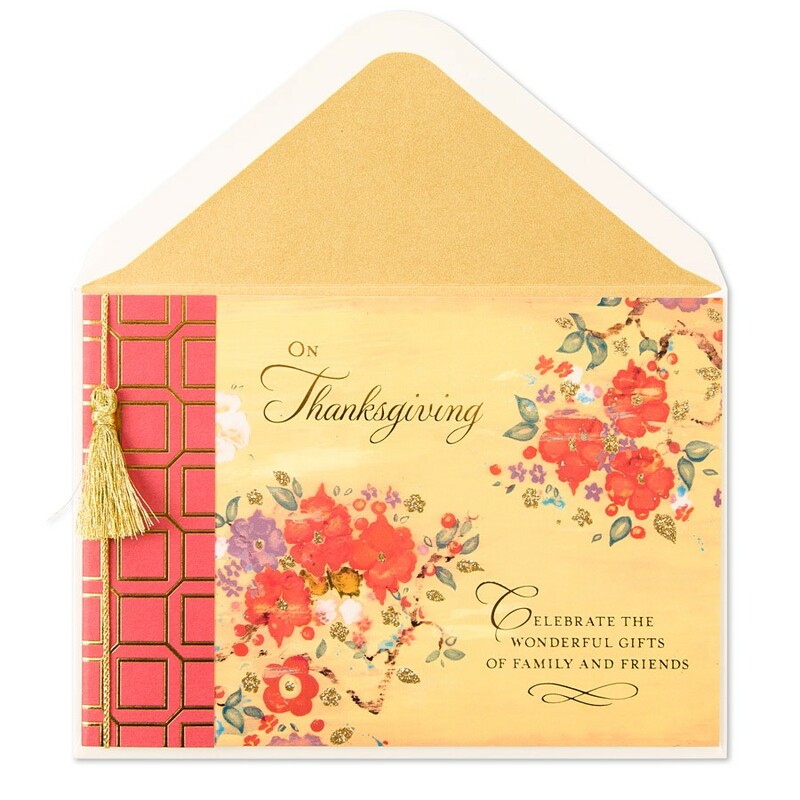 Each card the company creates and crafts is lovingly embellished with enchanting and magical extras like sparkling rhinestones and tiny gold charms. I hope you have a chance to see the new card along with the rest of Papyrus’s oh so lovely collection of cards for everyday and every holiday! 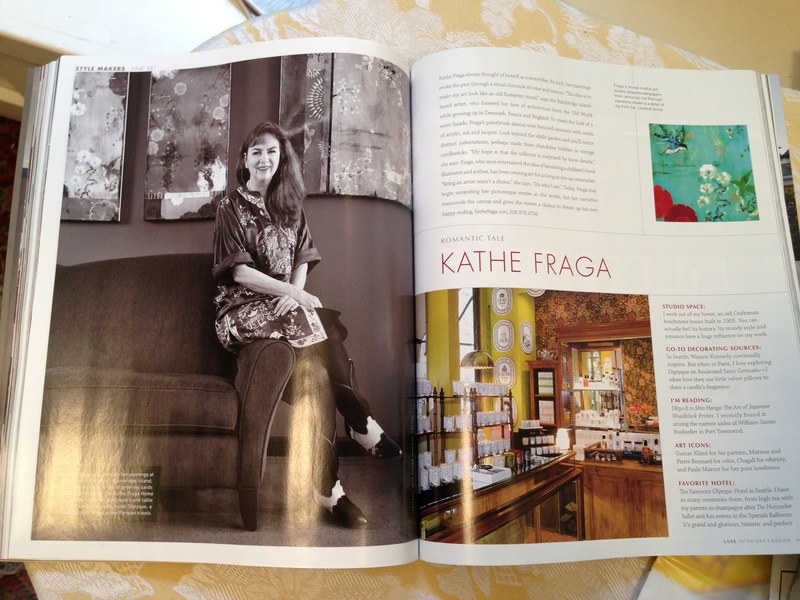 Inspiration in the studio and special thanks to LUXE Magazine for featuring my paintings. 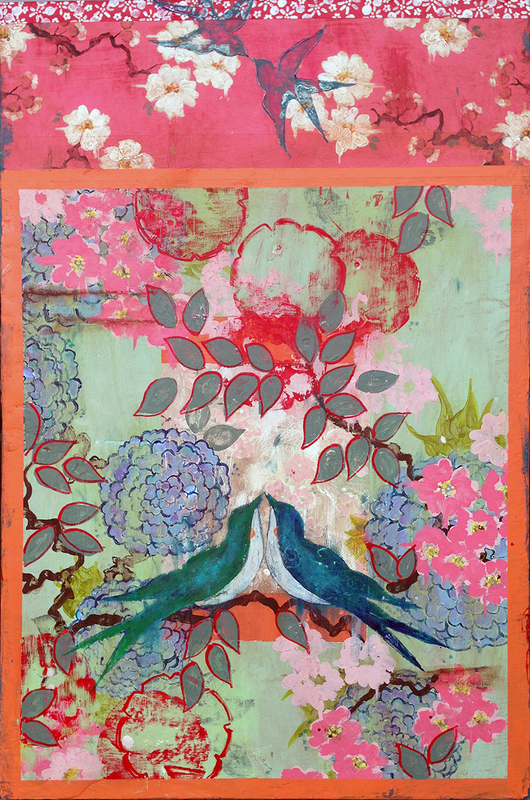 It was a delight to share the inspiration for my paintings with LUXE Magazine–Ukiyo-e’s vintage woodblock prints, the romance of age old Parisian wallpapers and murals, the patterns of silk and satin kimonos from long ago. 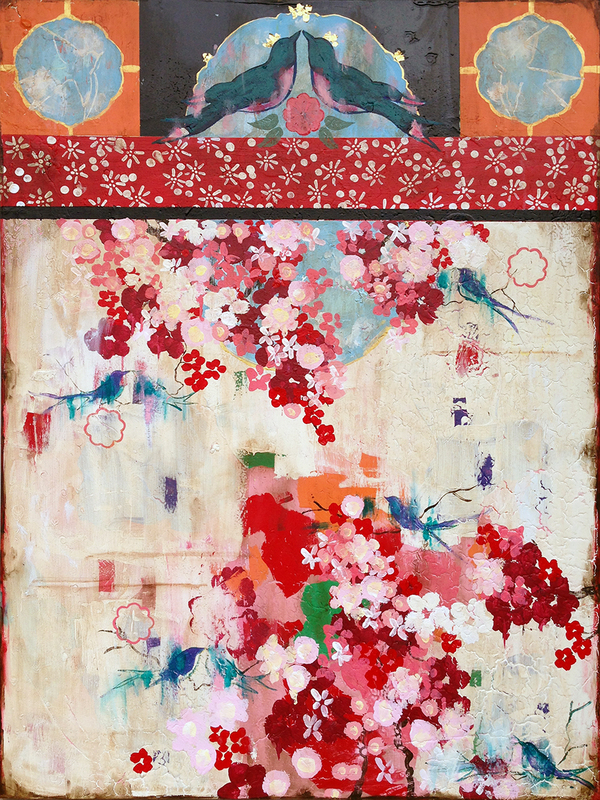 “When We First Met” I and II, now at Gallery Orange, New Orleans. Thank you LUXE for featuring my work. When we visited New Orleans for the very first time, years ago, it turned out to be one of those magical times when nothing was planned and everything was wonderful. I think that’s just how NOLA rolls. The incredible architecture, the wrought iron scrolls and swirls, the music on every corner, the drinks piled high on the trays, K-Paul’s, the streets filled with discovery, Cafe Du Monde, the jazz, the history, the food, the flowers…it was hard to leave. Pink has always been a favorite color–I grew up with a pink and white bedroom. And fast forward, when we renovated our 1905 vintage grey shingled cottage that shared the shores of Lake Washington with our neighbors in Beaux Arts Village, we painted the entry way and the all the cabinets and bookshelves in the family room a glossy “Pagoda Pink.” It didn’t seem outrageous or daring; it just seemed familiar and comforting. 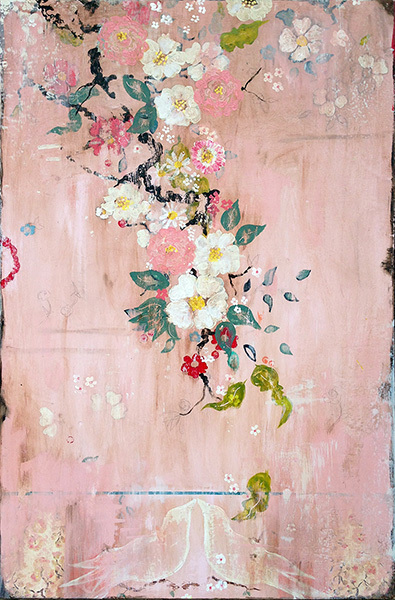 Now, years later, in another vintage home on the Salish Sea, I am still painting with pink. 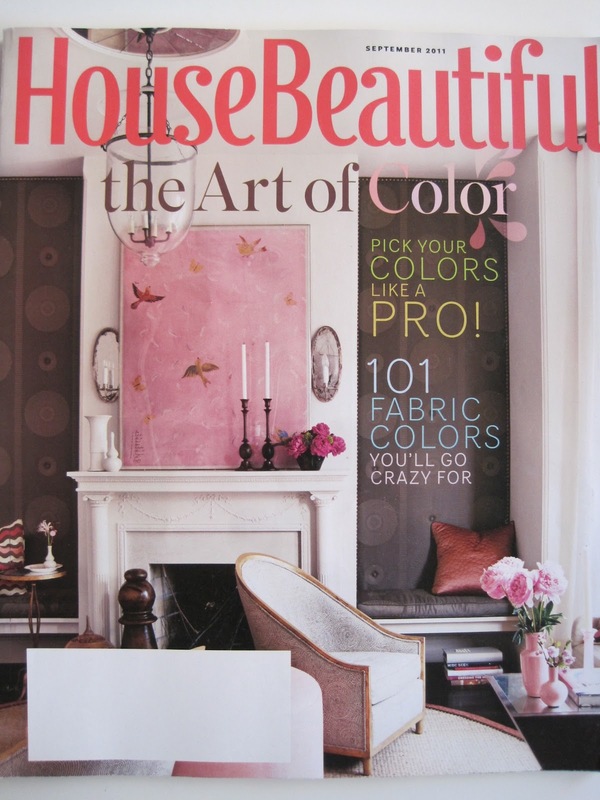 A few years ago, House Beautiful showed up in our mailbox with Barry Dixon’s “pink” cover with Paule Marrot’s painting over the mantel and it was such a moment. To see pink, front and center–not too sweet, not too cotton candy, but a wonderful and lovely color that has a place in adding beauty to a room. That was a wonderful moment. As always, I continue to paint with pink. Sometimes with orange, sometimes with red, sometimes just by itself. Pink will always be such an important friend in the studio. 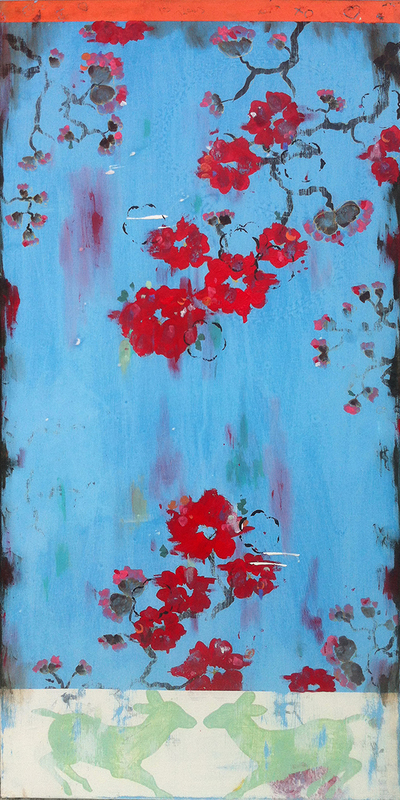 Kathe Fraga Art + Papyrus Cards for Valentine’s Day! Every year, our family makes a new rhyme for the new year. This time it’s “Live the Dream in 2015.” May all your wishes and dreams for the upcoming year come true. One of my dreams came true just recently. In Dec. 2013, I was commissioned by Papyrus Cards for a Valentine’s Day card. I was thrilled and couldn’t wait to see how their creative team would embellish the card with their signature rhinestones, glitter and 3D foil cutouts. But finally, the wait is over! A few days ago, I received a generous package from Papyrus Cards of the new cards and I’d love to share how it looks! 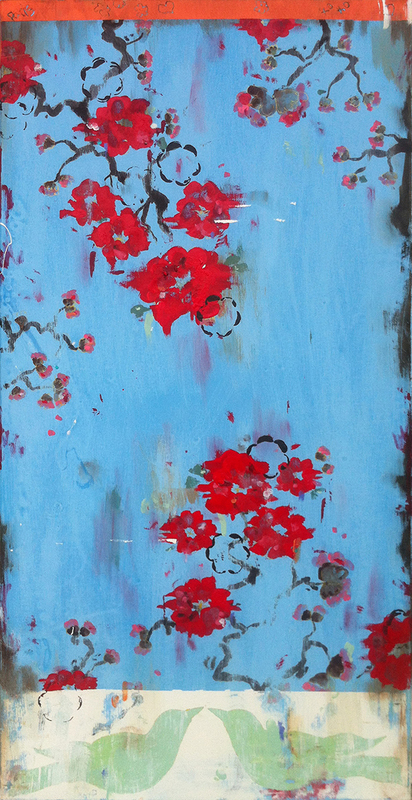 My new show, “Love!” , makes its debut this June at Museo Gallery. 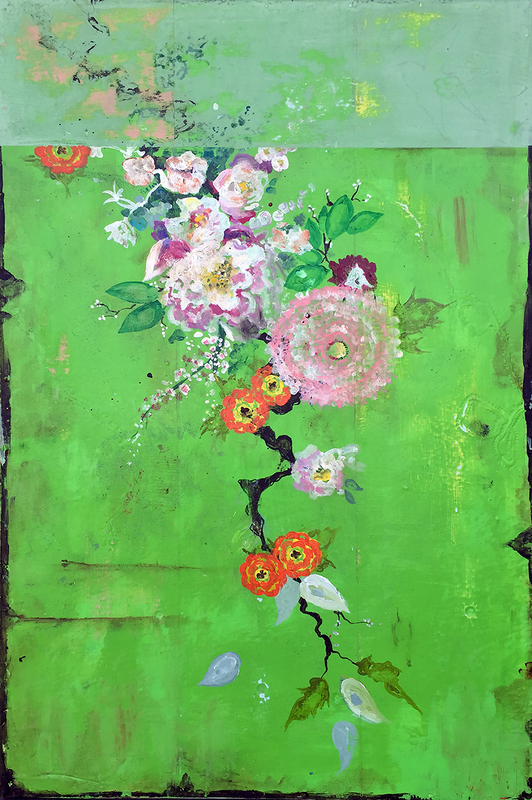 This new collection reflects my love of florals, blossoms and bouquets, combined with the centuries old chinoiserie that I adore. Thank you owner/gallerist Sandra Jarvis for representing my work these many years. It’s an honor to be a part of Museo–so lovely, always surprising and playful! Whidbey Island, home to Museo (Langley) is always “home” to me. I grew up visiting my Nana and PawPaw on the island in the summers–the fragrance of sun-kissed blackberries, the scent of big perfumey roses that my grandfather nurtured on their property overlooking the island’s blue sparkly water, the tall cedars and pines watching us all from overhead, even the surprising pink color of salmon: these memories of love weave themselves into my work. If you’ve followed my work or blog, you know how influenced and inspired I am by living so many years in South America and Europe and both coasts of the U.S. as I grew up. My paintings reflect this background. Different cultures, different colors, different homes and neighborhoods, old and new,the beauty of layers and layers of distressed images, of generations past, of stories told and retold. When you see one of my paintings from across the room, you might see a certain pattern and a color. When you look up close, you’ll see a small bloom behind another bloom, a bird motif over another pattern, a little bit of the mystery of what came before and what was added later. The soft blues, yellows, greens, (and new this year, peach), colors floating on frescoed panels with all the layers of motifs and imagery that came before and can be a bit glimpsed now, make up the direction of this June Collection at Museo. I hope you enjoy it!